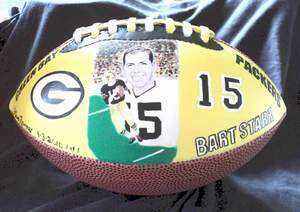 This Legends Hand Painted Bart Starr Mini Football features my original paintings of the Green Bay Packers Hall Of Famer. 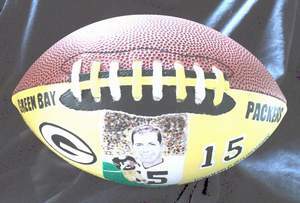 The center of this nine inch long football has my two paintings of Bart Starr with the Lambeau Field crowd in the background. Click here for a closer look. The laces are hand painted with Packers colors. 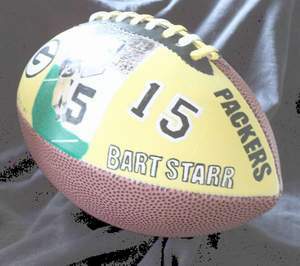 The right side has Bart's hand painted number 15 with his name below and "PACKERS" above. The left side has my hand painted Green bay Packers logo with "GREEN BAY" above. 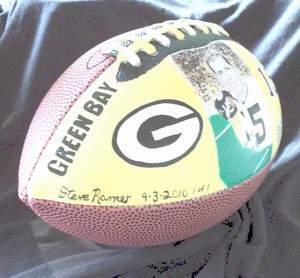 Along the bottom is my signature and the date this football was completed. You can also see next to the date, 1 of 1. This means that this is number 1 of only 1 created. This is a one of a kind piece of art. There will never be another exactly like it. or click on the Add To Cart Button below to use your credit card and Pay Pal.